It’s been cooler and cooler in Japan, finally. I hate the heat. Yesterday, we had a typhoon, and the temprature got down a lot. I needed a jacket to go out. Anyway, my cosplay life has been crazy as usual. My cosplay friends are planning to go to Kyoto[京都] for sightseeing and cosplay. I am really looking forward it. And this month, I cosplayed 4 times, it’s too much. My body is a bit sore. I know I am not that young. At any rate, my friends and I went to the cosplay event in Odawara Castle[小田原城], Kanagawa Prefecture. It was a very first cosplay event there, and according to the sponsor, it was really hard to have a permission to launch an event. If this event sure goes well, they are going to be able to do again. I hope they will because the location is really nice. Here was a rule in this event; cosplayers must wear Japanese costumes like yukata or kimono. This castle is designated as a tourist spot, so there are a lot of tourists. Because of this, cosplayers should fit this place. 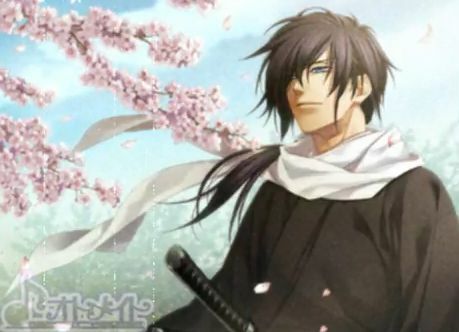 As the rule indicates, I saw just Gintama, Sengoku Basara, Nintama Rantarou, and…Hakuouki. Yes, we cosplayed Hakuouki. It was my first time cosplaying Hakuouki with someone else. My part is him. He is Saito Hajime[斎藤 一], and actually it was my second time cosplaying him, but the costume is different this time. Last time I did 洋装[yousou] style, but I did 和装[wasou], which means kinagashi[着流し]. And in fact the hairstyle is also a bit different, meaning his hair is longer than the one in 洋装. My friends did Hijikata and Chizuru respectively. As I said, the location is great. I want to cosplay there again. Here is one more happy thing I want to talk about. While we were taking photos, a group of cosplayers spoke to us to take a photo. And we let them. As we left the spot, those girls waved at us shyly. So I nodded twice. Two days later, the Hijikata cosplayer told me that he found a blog which seemed to write about me. The blogger is sure the cosplayer who spoke to us. According to the blog, she said like below. a. We spot the wonderful group of Hakuouki cosplayers, and asked photos. b. As they left, we were looking at them and waved. c. Just Saito noticed us, and he nodded twice. d. All of us were squealling for joy inside. e. All of us were too chicken to ask his name, why didn’t I ask his name?! My legs are sore. I wish I could say that’s because I was playing basketball a lot. But no, technically I was cosplaying a basketball guy. I am not good at sports as a matter of fact. Last Sunday my cosplay friend and I joined the cosplay event at the closed school. At this school, cosplay events take place sometimes, but it is going to close and won’t happen anymore. So I really wanted to use the place to cosplay him because the school has a gym. 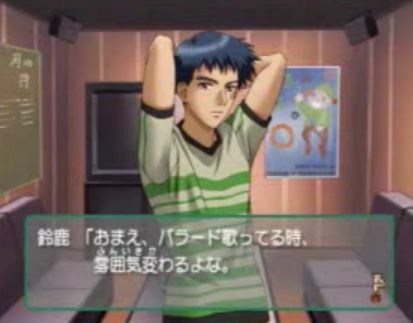 He is Rukawa Kaede[流川　楓] in SLAM DUNK. This anime was over long long time ago, but even that there are still lots of fans like me. Actually I can’t miss this manga whenever I talk about my youthful days. SLAM DUNK is loved by everybody including non-otaku people. 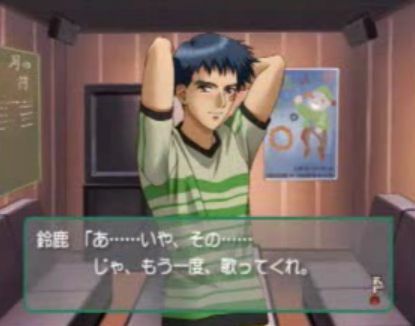 Rukawa Kaede is one of the lead characters, cool, a man of few words…and far from myself. That is why I adore him, I just wanted to be like him. I think I have ２次元コンプレックス. At any rate, the school was full of cosplayers, so that there was almost no space to take photos. The gym was used as a changing room for the first two hours, so we took photos in the classroom. After that I changed to the Shohoku uniform and went to the gym. But it was crowding. Almost no space. My friend did the best, she was trying not to let other people in the photos…The gym was so humid that we were sweating as if we really played basketball. I wish I could use a real gym to have a better photoshooting. Yes I will do. I won’t give up. Because I am from the generation called スラダン世代. Please play the music before you see the photos, enjoy. I have more characters to cosplay such as Shiki in Togainu no Chi or Italy in Hetaria, but sometimes I feel like cosplay the characters I have cosplayed before. Because the location could change the color even if a character is the same. For example, if I cosplay Lelouch, there are a lot of good locations like a plant, a church, or a gorgeous mansion. Some of my friends are trying as many places as they can. I think I should do it, too. So I decided to cosplay him again. 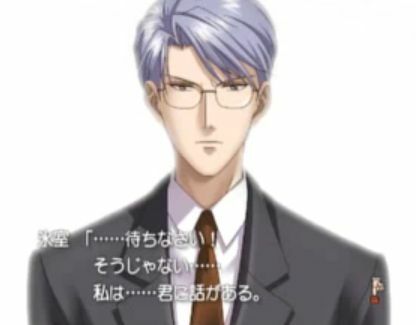 He is Himuro Reiichi in Tokimeki Memorial -girls’ side-. You know, I used to be a big fan of Tokimemo when I was a student. Of course it was a bishoujo game, so I pursued those girls. I didn’t know about otome games at that time. So I was a bit surprised to hear about the otome version of Tokimemo. As soon as I tried this game, I had a crush on Himuro-sensei. He is a math teacher, and very strict and cool. But as you get to know him, he would be nice to you. There is a scene in which he takes you to the sea by his car or plays the piano in front of you. Now that I have cosplayed Kichiku Megane, I truly realise he is a type of kichiku megane. Even the hairstyle looks similar. Also, he is voiced by Koyasu Takehito who is well-known as seme seiyu. At any rate, I cosplayed him at the same place as the last time I did Usagi-san. Since I really love this place, I came to have a photoshooting again. If you seriously love someone in your favorite anime or manga, and happen to wish you could get married to him(or her), that would be ２次元コンプレックス[nijigen complex]. However, if you always pursue someone in bishoujo games or otome games, the love shall be called 三択恋愛[santaku ren’ai]. The real love story is complicated. There are numerous choices at times, I mean, what to say or when to tell. If you made a mistake, you wouldn’t be able to get your sweetheart. In real life, you sometimes have such a hard time not only in love, but friendship or work. If you and your friend happen to have a fight, what would you do now? Are you going to apologize or keep ignoring your friend? Ring or e-mail? What are you gonna say? If you have a presentation at work, what would you do now? Keep talking or ask opinions? In this way, you need to choose a right option if you have to, otherwise you can’t move on. I wish it could be more simple and easier because I am not a type of person who can always get through. But at least there are love stories which have only three options so you just choose one. Even if you fail, you can start over again and again. That is 三択恋愛[santaku ren’ai]. 三択[santaku] means three choices and 恋愛[ren’ai] means love. Where could we have 三択恋愛? Yes, in bishoujo games or otome games. In case you have never played it, I shall explain. 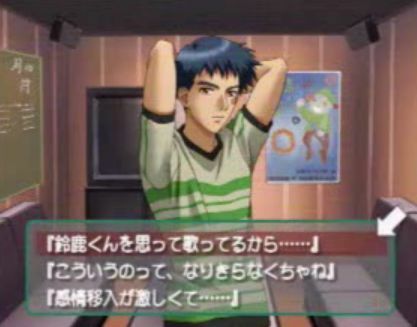 In this type of game, you are surrounded by several pretty girls(bishoujo) or good-looking boys(bishounen). And you can pursue your favorite in order to have a happy ending. After you finish, you can start over to pursue another target. As the story goes on, you are required to choose a option from time to time. Whatever you choose would affect the result of your date. If you choose a right one, it would be okay. If not, you wouldn’t be able to move on so you have to start over. If you ask me, it is pretty simple if there are only three options. Look at below example. Now you are in the karaoke booth with the boy you pursue. After you sang a song, he said, “Wow you looked different when you were singing.” And what are you going to say? a. Because I was thinking about you. b. I should pretend to be a singer, shouldn’t I? c. I am kind of emotional, you know. Okay let’s go a. And what is he going to say? This term became famous as an internet slang among vippers in 2ch around 2004. At that time, the story about 痴漢男[chikan otoko] or Groper was mentioned by someone, and at first it seemed to be just a comment but they created the love story. The storyline seemed to be like 電車男[densha otoko] or Train Man. It boils down that a 20-year-old guy who loves anime and insects is misunderstood as a groper by a young lady. It turns out to be just a misunderstanding, but he has a crush on her…But he has no experience of women, but 三択恋愛. We are human beings so it’s no wonder we make a mistake. Whichever it is love or human relationship, just one mistake could destroy everything. I had something like that before. We need to be careful when we are required to choose an option. Because real life is not a game.